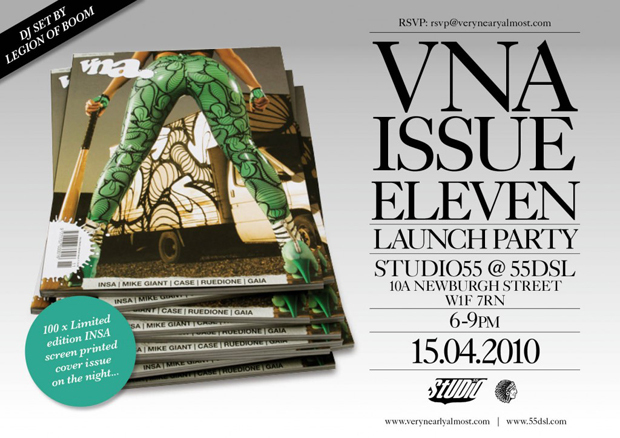 This Thursday sees the launch of street art and graffiti magazine VNA‘s 11th issue. In celebration, the mag are putting on a little shindig at Studio55 the art and party space located above the 55DSL store on Newburgh Street. The issue’s front cover features not only a slammin’ bootay, but the work of UK based street artist, painter and high-heeled shoe designer Insa. Rumor has it that Insa may be doing some live painting on the night, so it’d be worth taking some time to come along and check it out. Not only that, but there will be 100 issues with limited edition Insa screen-printed and signed covers available on the night. These will come packaged with new VNA x Insa stickers and a super limited Insa lighter, giving you even more reason to come along. The party runs 6-9pm this Thursday, if you wish to attend, rsvp to rsvp@verynearlyalmost.com. Emailed, hope I get a reply, it’s just around the corner and would be awesome. Would love to pick up a mag. Thats what you, ( this case I mean ‘I’ ), get when you don’t read dailystreet everyday! Damn. If I knew, I would have been there for sure. Any reviews anywhere? Impressions? Photos?